Don't stress! There may be an answer. Do you feel stressed? That approaching mortgage payment, the push to meet deadlines, the upcoming visit with the in-laws… I bet you feel stressed now! Most of us probably would. But if you were to ask a researcher like Dr. Derrick Gibbings, stress takes on a whole new meaning. Similar to our minds, the cells in our bodies have a remarkable ability to manage stressful circumstances. Normally our cells manage stress, such as infection, by re-allocating resources and halting unnecessary processes. It’s like taking a “Me Day” when work is piling up. “When the unusable material forms small aggregates, we call them stress granules” Gibbings describes. These granules are normally cleared out by a degradative process called autophagy, and cellular processes eventually resume. However, in nearly 200 000 people worldwide, this system has become defective, and this inability to “cope with stress” it thought to result in the onset of Amyotrophic Lateral Sclerosis (ALS/Lou Gehrig’s disease), a fatal motor neuron disease. Fortunately, behind every physician’s prescription pad are scientists, like Dr. Gibbings, working to discover causes and cures for diseases like ALS. Dr. Gibbings’ research is an important step towards a cure for ALS. “This [discovery] says a lot about what causes the disease” Gibbings says, “It gives us a mechanism in order to design new drugs.” This is another example of how hard-working researchers like Dr. Gibbings create the foundation for advancements in medicine. 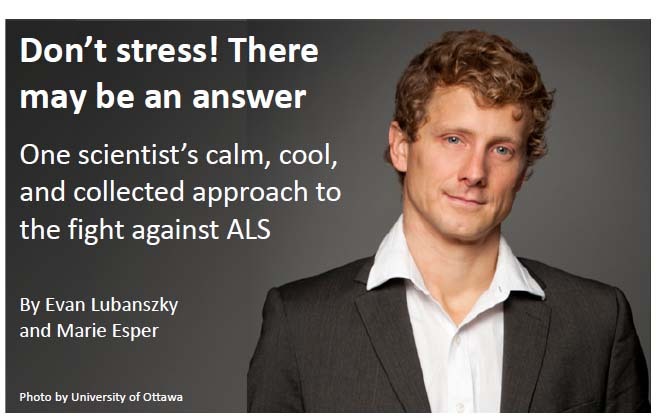 To him, understanding the molecular basis of ALS is fundamental for any potential treatment. But we then wondered, how does a man like Gibbings handle stress all day long (literally)? Within the first few minutes of our interview, we had our answer. “It’s not a great sales pitch for science” Gibbings says, laughing to himself “but I would have much rather been in philosophy”. In fact, Dr. Gibbings attained a Master’s degree in philosophy while completing his PhD in immunology. To him, it seems that learning how to think about a problem, is as important as thinking about the problem itself. Maybe this is the key to keeping cool in the face of a daunting challenges, such as curing ALS? “In science, everything we do uses models, and I think philosophy helps me read those models” Gibbings says “and think about what do we really know, and what are we just saying we know”. A powerful revelation from a highly critical mind. However, we do know ALS is a devastating disease that kills thousands each year. Thankfully, we also know that skilled and intelligent individuals like Dr. Gibbings are contributing significant discoveries towards finding a cure for ALS. Maybe we can all learn something from scientist and philosopher Dr. Derrick Gibbings. Continuing our series on meet the Systems Biologist, this article was written by TMM Science Communications students Marie Esper and Evan Lubanszky.